The unexpected, meteoric rise of the Buffalo Sabres in November had the city's hockey fans bracing for the franchise's first Stanley Cup playoffs appearance since 2011. A little over four months later, they are now awaiting word on whom General Manager Jason Botterill will choose to be the latest coach to attempt to break the organization's cycle of losing. Phil Housley, the Hall of Fame defenseman who took over as the franchise's 18th coach less than two years ago, was fired Sunday after a 33-win season in which the Sabres teased fans with a 10-game winning streak, only to finish 27th in the NHL. The 55-year-old went 58-84-22, with both seasons ending with Buffalo receiving a lottery draft pick. He joined Dan Bylsma, who hoisted the Stanley Cup as coach of Pittsburgh in 2009, and Ted Nolan as coaches dismissed under the ownership of Kim and Terry Pegula after only two seasons. "Today certainly wasn’t an easy day, but the results in the second half were just not there," Botterill said during a Sunday afternoon press conference inside KeyBank Center. "We were very inconsistent. Our fans expect more. We expect more. In the end, I thought this decision had to be made for our organization to move forward. We are all responsible for the success and failures of this organization. ... We all need to be accountable and not make excuses." 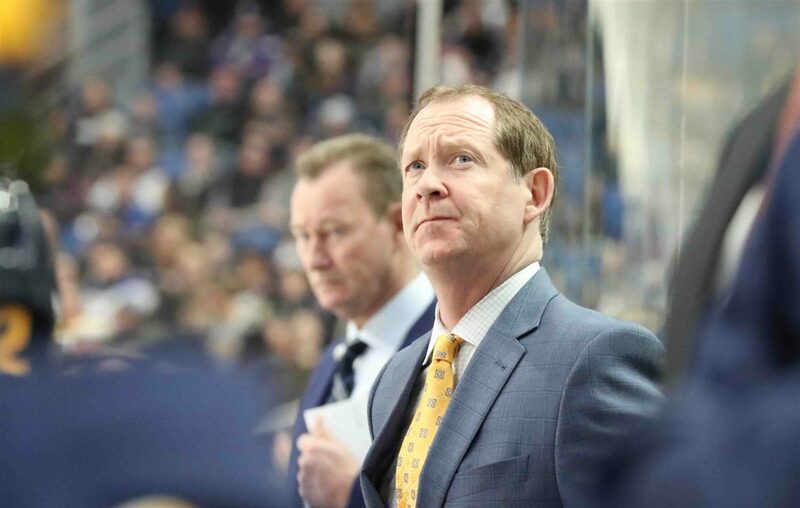 Housley had two years left on his contract and his replacement will determine if assistant coaches will be retained. That search began upon Housley's dismissal early Sunday afternoon, though Botterill declined to divulge details or characteristics he will look for in the Sabres' fifth coach in six years. Housley had a worse record than Bylsma and arguably endured a more tumultuous tenure. The Sabres finished with a league-worst 25 wins during Housley's first season, which led to them winning the right to draft defenseman Rasmus Dahlin first overall in June. Prior to winning Saturday's season finale, the Sabres had not won back-to-back games since Dec. 13, and were winless in 14 consecutive road games. Buffalo was shut out five times in 12 games from March 9-31, including three in a row, and won only two games during the month. That second-half historic collapse was not the only factor in Botterill's decision. He became concerned with the team's flawed defensive structure, familiar defensive lapses, the Sabres' inability to quickly exit their own zone during 5-on-5 play and repeated mistakes by veteran players. "Unfortunately, the message wasn’t getting through," Botterill said. "I thought that both sides, when we first came in two years ago, a big thing we tried to work on was the communication between players and the coaching staff. I thought our coaching staff really made an effort. I think our young players are certainly interacting with our coaches more, which is nice to see. At the end of the day, it didn’t result in success on the ice." Botterill also shouldered blame, saying he "didn’t put the proper roster on the ice" and didn't give Housley "enough players, enough tools to have success." Botterill overhauled the roster last offseason, trading center Ryan O'Reilly to St. Louis, adding two-time Stanley Cup winner Conor Sheary from Pittsburgh and acquiring winger Jeff Skinner from Carolina. The Sabres also signed Carter Hutton, a 33-year-old career backup goalie who was regarded as among the best available at his position. Skinner scored a career-high 40 goals — the most by any player during their first full season with the Sabres — and Hutton had a .936 save percentage during the 10-game winning streak. Jack Eichel and Sam Reinhart also produced career years, while Dahlin finished with 44 points, the second-most in NHL history by a defenseman before his 19th birthday. However, the team received little production from the three players acquired for O'Reilly — Tage Thompson, Vladimir Sobotka and Patrik Berglund — and Botterill admitted the Sabres are in need of more skill and secondary scoring. Defenseman Rasmus Ristolainen finished last in the league with a minus-41 rating, which tied the franchise record, and other veterans across the lineup delivered inconsistent efforts. Though the Sabres earned 18 of a possible 46 points in January and February, Housley received a public vote of confidence from Botterill in Tampa on Feb. 20. When the Pegulas met with reporters March 20 at the NFL owners meetings in Phoenix, they would not commit to retaining Housley beyond the season and expressed frustration with how the team's play deteriorated following the winning streak. Botterill said the players performed well enough in short spurts to give him confidence in keeping Housley, however, that stance changed when the Sabres went 5-18-3 over their final 26 games. Cracks began to emerge in February when Reinhart reacted to a 6-5 overtime loss to Carolina by saying, "We need more from our goalies," only to insist one day later that his comment "came off the wrong way." Eight days later, Housley referred to his team's play as "soft" following a 6-2 loss to the New York Rangers. During the Sabres' free fall, veterans called for more pride and accountability in the dressing room. In the end, Housley took the fall for a team that buckled when games became meaningful. "I think we had, unfortunately, the same lapses defensively in our structure, especially when you’re coming back after the All-Star break and playing in those tight games and those tight situations," Botterill said. "Some of those same mistakes were continually showing up and at the end of the day, this is a result-driven business and we didn’t get results." Prior to returning to Buffalo, Housley spent five seasons as an assistant coach with the Nashville Predators, helping them reach the Stanley Cup Final in 2016-17. His first NHL coaching opportunity came in 2013 after he coached the U.S. world junior team to a gold medal and earned bronze as an assistant at the men's world championship. Drafted sixth overall by the Sabres in 1982, Housley had 19 goals among 66 points in 77 games as a rookie, adding seven points in 10 playoff games. He spent the first eight years of his career with the franchise and ranks fifth in its history with 558 points in 608 games. Housley retired in 2003 with the most points (1,232) and games played (1,495) by an American-born player. He was inducted in the Hockey Hall of Fame in 2015. His hiring was universally lauded, but any growing pains Housley experienced in his first two seasons as a coach will not necessarily impact who Botterill picks as the replacement. "I think we’re still going to be open though, from what we want in our next head coach, so there’s nothing really clearly defined from that standpoint," he said. Lance Lysowski – Lance Lysowski is the Sabres beat writer for The Buffalo News. He previously covered the Pittsburgh Pirates and University of Pittsburgh athletics.